As you may have seen from my photo diary post. I was getting very autumnal with my outfit and actually got some lovely comments. I though it was more than fitting to show you this outfit! It’s very simple, but so cosy and cute. 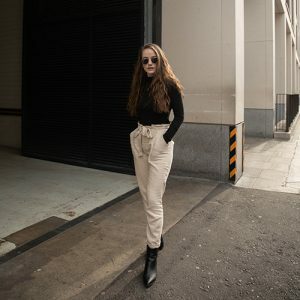 Perfect for this time of year if you want some autumn outfit ideas! Firstly is this knitted jumper from New Look. This is my absolute favourite jumper and I’m so glad I can wear it once again! It is so cosy and not too thick, but not too thin. So great for layering with jackets, scarfs or coats at this time of year! And, the best part, it was only £7.99?! I bought this last year but I believe they are still selling them this year or some very much like it if you want to get your hands on a cheap and great quality jumper! But I then tucked the jumper into a plain back mini skirt from H&M, paired that with some plain black tights. I wore thinner ones than in the picture. The ones above are fleece lined tights from BHS, and are the greatest things you can own in the colder days. They just remind me of the wooly tights I wore as a child. Depending on the weather obviously determines how tick or thin your tights may be but definitely get your hands on some of these bad boys for winter! These were quite pricey, but Primark do packs of them for around £2.50 and are good quality! Are you surprised? Ankle boots. An essential to everyone’s autumn wardrobe I think. These are a pair from H&M and were about £27.00 and are amazing quality, and such pretty shoes. Can’t complain for that price really! I feel these are a little more snazzy than regular ankle boots. I’d usually wear some like these (But mine broke yesterday oops). But these add a lovely classy touch to an outfit, perfect for autumn days out in the city! For accessories, I kept it quite minimal. Minimal is my style so if you’re into more statement pieces definitely feel free to spruce it up with a chunky necklace. But I added this dainty choker from ASOS and these, what I like to call ‘librarian glasses’ from DressLink (yes they are fake, but I wish they weren’t!). Both give a lovely autumn vintage vibe which is perfect for this time of the year. I feel it looks quite relaxed and cosy. And finally, it wouldn’t be an autumn outfit without a tartan scarf now would it? I actually didn’t add this to the outfit when I wore it. But alas I don’t think it’s chunky scarf weather just yet. This scarf is basically a blanket, and was only £12 from Sainsburys?? Mad. But for when the days do get colder, this would be perfect to wrap around your neck to keep you warm and cosy. But also looking very fashionable! I hope you liked this little outfit post, I can’t say fashion is my strong point but I do like it a lot so hopefully I did okay! 22.10.16 // The Bloggers Meet Up. You picked up some lovely things, that jumper is so lovely and so cheap! Love the ankle boots! The jumper and scarf look so cosy! They’re so nice I live in them at the moment! They are so cosy, and so cheap, win win! Loving the whole look, especially the scarf and ankle boots. I need a pair in my life. Such a lovely autumn outfit – I love a good winter jumper! I’ll definitely look out in New Look for a similar one. And those shoes are absolutely gorgeous. I don’t wear heels but they look like they’d be easy for a complete noob! I’m actually in love with those ankle boots! They are stunning! looove the look! I need one of those scarves!! Love the ankle boots and the scarf! Yes I would love to do more fall fashion inspired posts on my blog because I just love Autumn! Everything about this outfit is super adorable. I love the glasses and the scarf because I’m a sucker for quality accessories. I bet you look super cute in it.